Veg Here I am thinking a lot about Ms El, Zee, Sunflower, everyone at their school and in their neighbourhood. I got sent this post before the storm Sandy hit. I hope they are all ok and we hear from them soon. 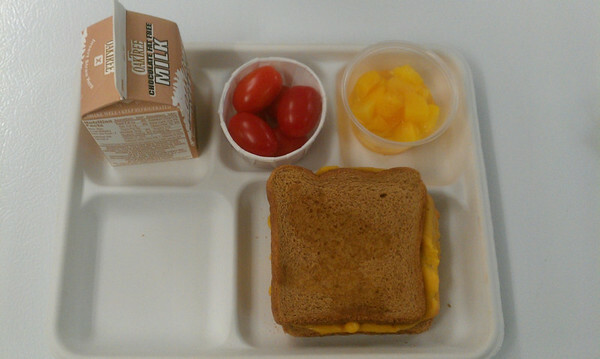 Today’s “A” lunch option was grilled cheese. I realize we have not been describing our lunches in much detail, so I will try to fix that with today’s meal. I have been eating the school lunch with the children this week. “American Cheese” is a little hard to describe. Some people insist it is not cheese at all, but a processed dairy product. It is creamy and salty, and it melts very smoothly, but it doesn’t have any strong “cheese-y” or sharp flavor. The whole wheat bread is very soft and toasts up nicely in the oven. The tomatoes were perfectly ripe and sweet; I tried the ranch dressing dip that the children were offered with the tomatoes, but I preferred them plain. And, the peaches were very good. 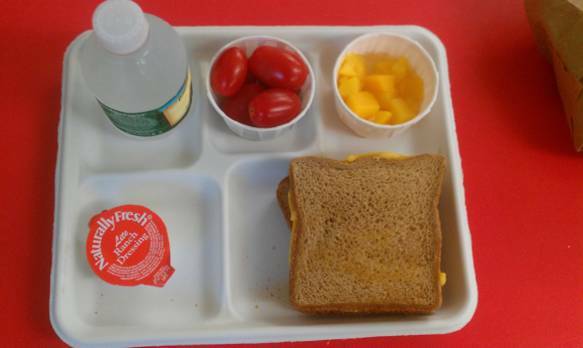 I remember canned peaches being too sweet when I bought school lunch as a kid (I grew up nearby in Queens, New York City), but the peaches schools serve no longer come in heavy syrup. They’re canned in juice and water. I am not, and never have been a milk drinker. I drank it the first three days of our project, but I couldn’t stomach it yesterday, so I had a water. Zee opened his bag of “veggie straws” from home, and ate that for the rest of the lunch period. With a lot of coaxing he took a nibble of cheese from inside his sandwich. I took a peek at the label on the veggie straws. They are mostly made of potato flour and starch, they’re doesn’t seem to be much to them. I don’t really have an opinion on how “healthy” or “un-healthy,” this snack is. I can tell you that I’ve had them before, and I definitely would not have been full enough after lunch. But, Zee did not seem to be hungry. The weather has been a little wet in New York this week. The children had a relaxed indoor recess period before lunch. They definitely eat more of their lunches when they run around before coming into the cafeteria. Zee’s class also had a snack break sometime in the morning. I’m sure his parents sent him in with a large morning snack. The Veggie Straws are a snack from home. Price: $2.60 (£1.62) for students $3.75 (£2.34) for adults (some students are eligible for reduce-fare or free lunch). Sunflower- “Today the grilled cheese was good. It took 20 bites to eat. The peaches are good and the tomatoes are [takes a bite, gives me the thumbs up sign] good. The chips I have aren’t healthy, but I bought them because my sister got some too and she likes them.” Sunflower also did not drink her milk. She did finished her entire sandwich and a good portion of the sides. Calling that packaged food "veggie straws" seems highly-optimistic if no doubt completely accurate - one imagines that in addition to "potato flour" the "starch" referred to derives from corn (i.e. maize). It sounds absolutely disgusting. The meal of the other child seems marginally better. In general the meals this week seem awful, but I expect it is at least partly a function of the home environments that these children come from. Although I personally would not care to eat a completely vegetarian diet, I must say that the food from last week (from India) seemed immensely better. Couldn't this week's children have a few sticks of fresh carrot or celery in their lunch-boxes? A lot more healthy and probably a good deal cheaper than over-processed 'muck' (I'm sorry, but I can't think of a nicer way of describing packaged 'veggie sticks'). Mind you, would at least one of these children eat this, given the shockingly-poor nutritional examples that seem to be available? I'm so pleased I went to school before awful products such as 'chicken nuggets' became common. I'm all with You about the fresh vegetables..
We don't have those "veggie straws" here in Germany, so I had to search the web for some more details about that stuff.. Potato flour (Potato flakes and Potato starch), sunflower oil, wheat starch, tomato puree, spinach powder, salt, sugar and turmeric. So in fact, it's potato chips with some (natural) vegetable aroma added. And those things are made like chips, with a whole lot of fat involved in the process. 130 calories per pack, of which 50& comes from fat. Healthy? Well.. compared to say.. BBBQ Chips they sure are a lot healthier. But compared to fresh vegetables they are about as healthy as BBQ Chips. To read that kids in an age, when teaching them what healthy food is and why it is so important to keep away from too much unhealthy stuff would be the thing to do, get stuff like that to eat and even consider it healthy makes me kinda sad. School doesn't teach them.. parents don't teach them (probably they don't know it better themselves..) and the food industry makes lots of money selling stuff like these "veggie staws" by presenting them as healthy food, because they contain 30% less fat than ordinary potato chips. Wow.. Still a massiv amount more than a real carrot. I know many schools have finally decided not to offer chocolate or strawberry milk for school lunches. Given the fact that it seems Sunflower and Zee often don't drink most (or any) of theirs, the thought does occur to me that they might just as well be throwing out regular milk. If nothing else, I assume chocolate or strawberry milk is more expensive. If it's just going to be thrown away, why throw away the more expensive stuff? I know some schools in the storm area are back open by today. Long Island was one of the harder hit areas, so they may remain closed a few more days. If nothing else, the power is still out in large areas of Long Island and many schoools are still in use as emergency shelters. Even when they re-open, public transit is still crippled, so many students and teachers may not have a way to get to school. For those not familiar with US geography, this storm was about 900 miles/1450 kilometers in diameter (which is more than twice the distance from London to Edinburgh), so encompassed most of the eastern US, and its effects are being felt as far west as the Mississippi River. So it's about a third of this very large country that is trying to deal with the aftermath of this storm. Ms El, Zee, Sunflower another great post and Zee certainly is entertaining. My thoughts are with all on the East coast of the USA. American cheese is a processed cheese product but it varies greatly by brand. Some are organic and natural and some have lots of fillers. Other countries have it and it is just sold as cheese singles- the processed part always seems to be in very small print! 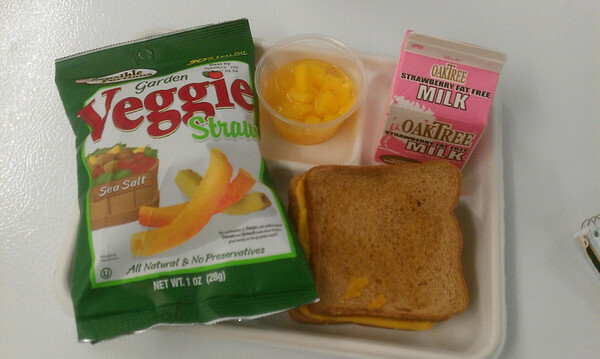 I am a bit surprised that the lunches from this week were not healthier. I can see the healthy attempts. Those are even minor. Bread, veggies. These kids seem to have a lot of influence from home of not liking something. Picky children aren't born picky. I hope that changes can be made in the US to use less processed foods. Even if they aren't "kid friendly" health begins early. It makes me sad when children say that chicken and veggies are healthful so chicken nuggets and any sort of product with "veggie" in the name are healthful. They're learning, but learning only half the story. It makes me sad when children believe that because chicken and vegetables are healthy that things like chicken nuggets (usually with a sugary/fatty/salty sauce) and anything with "veggie" in the name are good food choices. Kind of like finding out that a good number of them believe that greenhouse gases are *produced* by greenhouses. They're learning, but learning the wrong things.